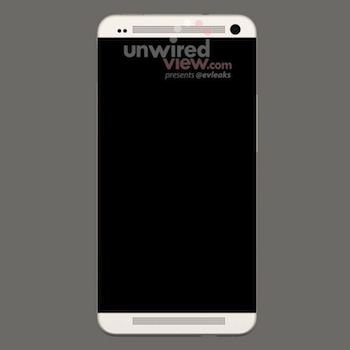 The HTC M7 has been leaked ahead of its possible launch at Mobile World Congress next month, but before you get too excited, it’s a render of the phone and not an actual picture, blurry or otherwise. The device has been rumored ever since the release of the Droid DNA, and is believed to be the firm’s second handset with a 1080p display. Its design is somewhat familiar, as it takes elements of the Apple iPhone 5 – the curved corners and straight sides – and the forthcoming BlackBerry Z10, with clearly separate top and bottom sections sandwiching the screen. It’s a considerable departure from the One X and the Droid DNA, and could be part of a complete redesign of the range. The image you see here was leaked by @evleaks, the same account responsible for showing us the HTC Deluxe, which subsequently became the HTC Butterfly. Apparently, it comes from a brief animated clip used to instruct new users where to insert the SIM card into the device. When the M7 first appeared it was suggested the phone would have a 5-inch touchscreen with a 1080p resolution, just like the Droid DNA. However, this is at odds with the latest information, which says the phone will still have a 1080p resolution, but the screen size will be 4.7-inches. This fits in with the theory it’ll be replacing the One X when it’s launched. Inside, the quad-core Tegra 3 used in international versions of the One X may have been swapped for a Snapdragon S4 Pro, while the camera will be upgraded to one with 13-megapixels. Another possible feature is a built-in infrared sensor, which thanks to an ability to learn codes, could be used to turn the device into a universal remote control. Also, HTC could introduce its newest version of Sense, Sense 5, on the M7. Following the initial leak, the M7 turned up on an extensive list of HTC codenames, where there were eight different variations of the phone, again hinting at its future flagship status. We’re expecting HTC to have a busy Mobile World Congress, and that the M7 will be one of its headline announcements.